29front/27.5 rear...anyone try it on a hardtail? 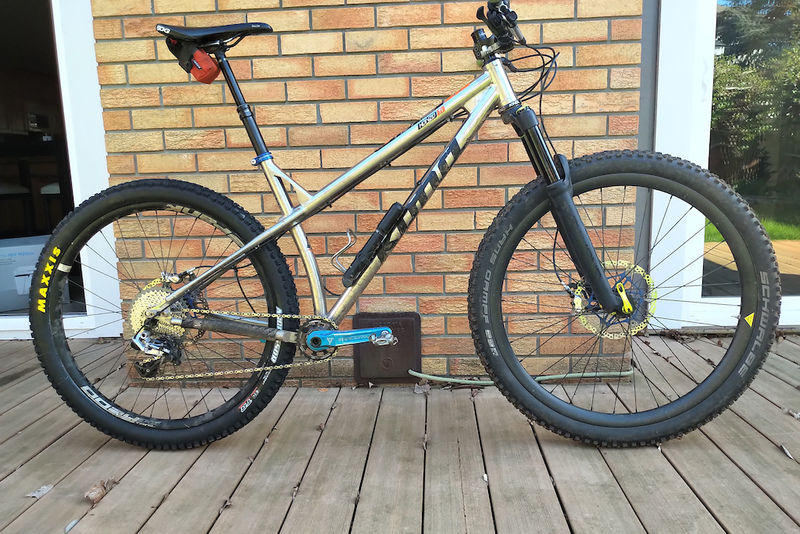 Wondering if anyone has any experience with swapping their rear wheel on their 29r hartail for a 27.5? April 13, 2019, 8:14 a.m. Some like a 27.5+ rear, 29 front combo. I know one rider on this and he loves the extra cush in the rear. I tried it for one ride, it felt a little odd and I could not stop worrying that I had more traction out back than the front. I feel that a regular 27.5 on the rear is not going to roll over chunk as well and ride a bit rougher. No idea how it would affect handling. I took out my 27.5 hardtail after a week riding my honzo - the 27.5 is so much more fun to ride. To be fair, it has a slacker HTA at 64 but I think the better cornering is a feature of the smaller wheels as much as anything. I did some calculations - haven't used SOHCAHTOA in over 10 years, who said high school math was useless? - I calculate that on my large wheelbase the 27.5 rear wheel will slacken the HTA from 68 to 66.7 and drop the BB by only 9mm. In short, I'll snap some photos and give ride impressions once it's done. April 14, 2019, 6:31 p.m. In general I think it would be better to take a 27.5 bike and put a shorter travel 29" fork and wheel on it. You can match stack height exactly if you wanted, and it wont affect the intended frame geometry at all. But take whatever you've got and do some science for us. My prediction is that it the 9mm drop in BB will be quite noticeable because the Honzo is already very low. And if you're using a 120mm fork it will be OK, but much more then that and you'll slacken out the seat angle too much. You can play around here without having to recall high school math. Last edited by: FlightlessLobster on April 14, 2019, 6:54 p.m., edited 2 times in total. I have a 130mm fork and I use a 10mm spacer, so I can just remove 5 or 10mm as needed. The BB should drop by exactly 87mm (if my grade 8 calculations are correct). I suspect it will feel no lower than my Evil does at the end of the day. And hey, I have aluminum cranks on there that are a colour I absolutely loath - more scratches the better. As for the STA, my Lynskey has a 73 and I love that one so I am not too worried about 73.3; I prefer climbing standing most of the time anyways. I am pretty stoked on this but also prepared to be disappointed. April 14, 2019, 10:22 p.m. Some dicks sent a 142mm 275 rear wheel instead of BOOST so haven’t tried yet. April 15, 2019, 7:59 a.m.
Rear tire squirm is not an issue for me on the rear of a HT, it doesn't get pushed into corners near as hard as a FS bike nor is it ridden at the same speeds. The same can't be said of the front though, where I found the 29 front with proper pressure improved on the precision, rollover, and speed of the ride. 27.5+ up front to me felt vague and slightly delayed in steering response. he loves the extra cush in the rear. I tried it for one ride, it felt a little odd and I could not stop worrying that I had more traction out back than the front. I do really enjoy the extra bit of give especially on a hardtail. But the climbing traction gains are the biggest improvement IMO. My plus tire at 14.5 PSI just seems to swallow up smaller roots and rocks and irregularities and you just keep on trucking up and along without nary a slip. I don't feel any variance in cornering traction with the plus rear tire; the rear tire, especially on a hardtail, just kind of follows along what the front does in most cases. No one seams to know it, but apparently the Honzo was meant to run a 27.5 rear wheel. This bike is sooooooo much more fun and corners a million times better with the smaller rear wheel. The climbing is about the same. I can't quite figure out if it is the smaller wheel or the lower bb but I just can't get over the cornering. Seeing as how my other two 27.5 bikes corner like this, I tend to think it is the wheel size. I suspect it is the arc of the wheel, kind of like a ski with a larger side cut making sharper turns, a smaller wheel turned on its edge has a smaller turning radius.